As a follow-up to the October 2006 release of a Climate Change Plan and legislation by then-Environment Minister Rona Ambrose (see Canada Initiatives for more information), in April 2007 Environment Minister John Baird announced a new climate plan for Canada, entitled Turning the Corner: An Action Plan to Reduce Greenhouse Gases and Air Pollution. The Conservative government's commitment is to reduce national absolute greenhouse gas emissions by 20% from 2006 levels by 2020. Canada's international commitment under the Kyoto Protocol is to reduce greenhouse gas emissions to 6% below 1990 levels by 2012. Under the current government's plan, Canada will not reach its 2012 Kyoto commitments until at least 2023. In contrast, the European Union agreed in March 2007 to reduce greenhouse gas emissions by 20% below 1990 levels by 2020. Almost two and a half years after the release of its Climate Change Plan, the Government of Canada unveiled its plan for the implementation of the plan. The first phase of the now defunct "Project Green" was the release of the publication entitled Moving Forward on Climate Change: A Plan for Honouring our Kyoto Commitment on April 13, 2005. There was criticism of the plan, and some groups noted that the timelines for implementation are tight if Canada is to meet its Kyoto commitments, as outlined in the 2002 Climate Change Plan and the 2005 Implementation Plan. The Pembina Institute issued a press release and backgrounder on June 13, 2005 that laid out a schedule of implementation steps for the government to take in 2005 to be credibly on track to meet our Kyoto target, which begins to apply in just two-and-a-half years time. The Pembina Institute intends to issue regular reports during the remainder of the year on the government's progress in meeting the schedule released June 13, 2005. With the change in government in 2006, the Pembina Institute shifted its focus. The Kyoto Protocol, and international negotiations and discussions surrounding growing scientific evidence of human influence on the world's climate were the motivation for Government of Canada to develop a Climate Change Plan for Canada. In December 2002, Canada ratified the Kyoto Protocol, meaning that both the House of Commons and the Senate voted to support Canada's commitments under Kyoto. Most first ministers - Premiers of provinces in Canada - urged the Prime Minister to ratify. On November 21, 2002, the Government of Canada released the Climate Change Plan for Canada. It was the result of 'consultations' with provinces and territories, industry, and non-governmental organizations. (The plan followed the May 2002 release of a Discussion Paper on Canada's Contribution to Addressing Climate Change and an October 24, 2002 release of the Climate Change Draft Plan: Achieving our Commitments Together). It must be a made-in-Canada approach based on collaboration, partnerships and respect for jurisdiction. There must be a reasonable sharing of benefits and burdens requiring responsible investment by all. Our approach must be transparent and proceed step by step, keeping our Plan evergreen. Minimize mitigation costs and maximize benefits. 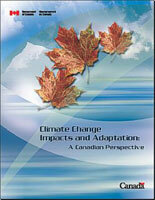 The federal government released its report, Climate Change Impacts and Adaptation: a Canadian Perspective in July 2004. Chapters focusing on the various sectors and specific areas impacted were released as they were finalized in 2002 and 2003. As of 2006 and the election of the Conservative government, this web page and these reports are no longer available.